You might remember them fondly from your own youth, you might be a current collector looking to add to your arsenal, or you might just be utterly bewildered by the whole thing: in any case, Nerf guns are showing no signs of going away. And why would they? Foam dart guns offer a socially acceptable way to attack your loved ones, and an active way for kids to play indoors or out, rather than being glued to a tablet, so they get a big thumbs up from us. But what is best nerf gun? Well, in foam dart warfare there can only be one winner, but when it comes to finding the right nerf blaster, it all depends on what you’re looking for. If you’re shopping for yourself or an older child, you can go as big as your budget (or your other half’s patience) will allow. If you’re looking for a first gun for your littlest though, be wary of hard-to-squeeze triggers, got-to-get-the-knack-of-it loading techniques and ultra powerful rapid-fire guns which might be out of their comfort zone (or turn them into tiny Terminators, which is equally terrifying). Be warned, some of these 'toys' come with age restrictions, with many of the newer, more extreme nerf guns advisable for ages 14 and up only, something to consider if you are looking to make a purchase for a little one. 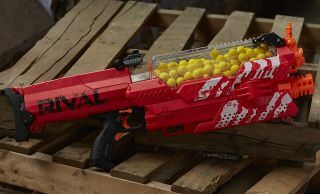 So from the classic nerf blasters for beginners to the extreme Nerf Nemesis guns for adults, check out our round-up of the best Nerf Guns. Looking for the best entry to the Nerf world? Try this awesome budget blaster on for size. For its combo of all-round impressive functionality and a budget price, this manual blaster takes the crown for best value Nerf gun. It’s easy to load through the flip-open rotating barrel, it fires darts up to 75 feet, and once you’ve cornered your target, you can rain down on them with rapid fire using the Slam Fire slide. Jolly good fun, and a superb entry-level Elite Nerf gun. This pocket-sized Nerf gun is the perfect tool for the wily assassin, an ultra-small blaster that packs a big punch when correctly deployed. The range is pretty impressive for such a small shooter, so you can even use it from afar for a game of hide ‘n’ seek with a deadly twist. Dinky, and very simple, yet powerful. A great backup gun. Unleash a reign of terror on your friends and loved ones with this high-speed blaster. Rather than darts, it employs yellow spheres about the diameter of a 2 pence piece, and lots of them, for speed and accuracy. Unlike earlier iterations, it’s super fast to reload — simply pour the rounds into the chamber — if you can retrieve your ammo in time. The amazingly named Doominator builds on the effective action of the Strongarm blaster, with four barrels instead of one for increased firepower, adding to its impressive accuracy and range. Plus, its distinctive Zombie Strike colourway looks awesome in any collection. It takes a bit of dexterity to load and pressure to fire, so it might be better kept for older kids. This blaster’s removable tactile shield gives you the option for defence as well as offence, but make no mistake, because it really is all about the rampage. If you want to swagger into your next foam fight feeling like Arnie, this is the one. With a range of 60+ feet and pump-action slam fire it gives the option for firing from a distance or advancing on one unlucky victim of your choosing. The very model of blasting efficiency, the RapidStrike CS-18 earns its place on our list with its incredible rate of fire. A rare fully automatic offering from Nerf, the transparent quick-reload clip can hold 18 darts and lets you keep an eye on things, and you have the option for single-shot firing or a devastating continuous hail of darts. Be warned though: this isn’t a stealth gun, and those helpful motors can easily alert others to your presence. This Elite Nerf blaster is easy to put together and even easier to load. Together with its quick and accurate semi-automatic firing, it makes an awesomely simple package for first-time users, and its revolutionary rotating ammo rack lets you quickly continue unleashing a storm of darts after finishing your clip. Weirdly, this gun only comes with four of the maximum eight clips compatible with it, so to use it to its full potential, we recommend stocking up. Best for: Firepower | Battery powered: 6 D batteries | Darts in a clip: 50! This borderline ridiculous blaster (no, we don’t know what rhinos have got to do with it either) is an advanced addition to any dedicated foam warrior’s collection. It’s double-barrelled with motorised rapid fire for maximum pain, and you can choose between setting it up on the tripod for stability and accuracy (from a secure location of course) or removing it for firing on the move. We recommend laughing maniacally while using it, but it’s up to you.